A while back, I wrote a post about how I was trying to reduce disposables in my 4-yo’s lunchbox. 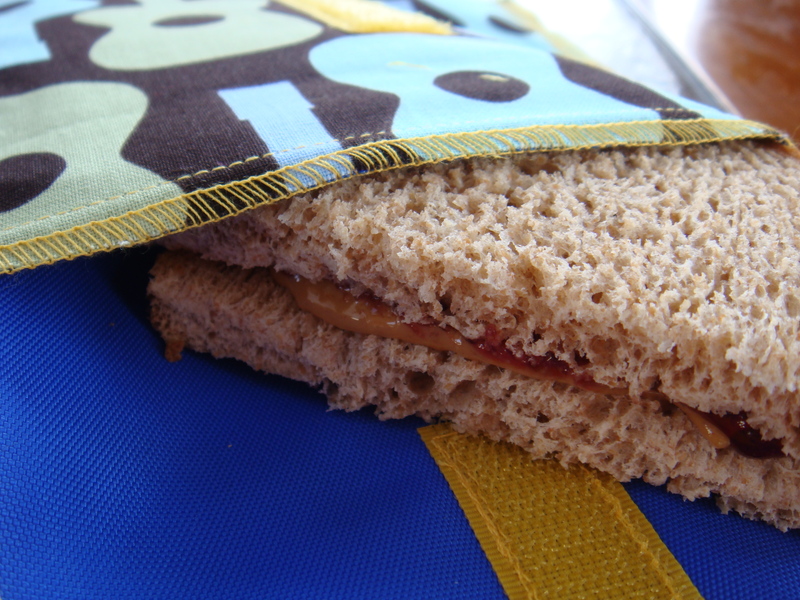 I had been successful with everything except his sandwiches — as I was still using Ziploc bags. 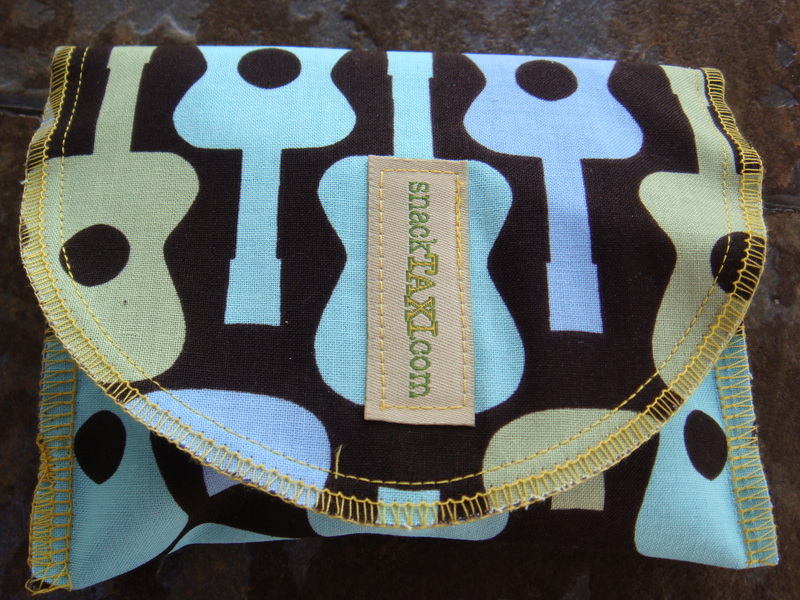 I received a comment on that post about snacktaxi.com, a local company (in Plainfield, MA) that makes little, reusable, canvas bags. Of course I had to check them out… and was pleasantly surprised by the design, cost and the great patterns! 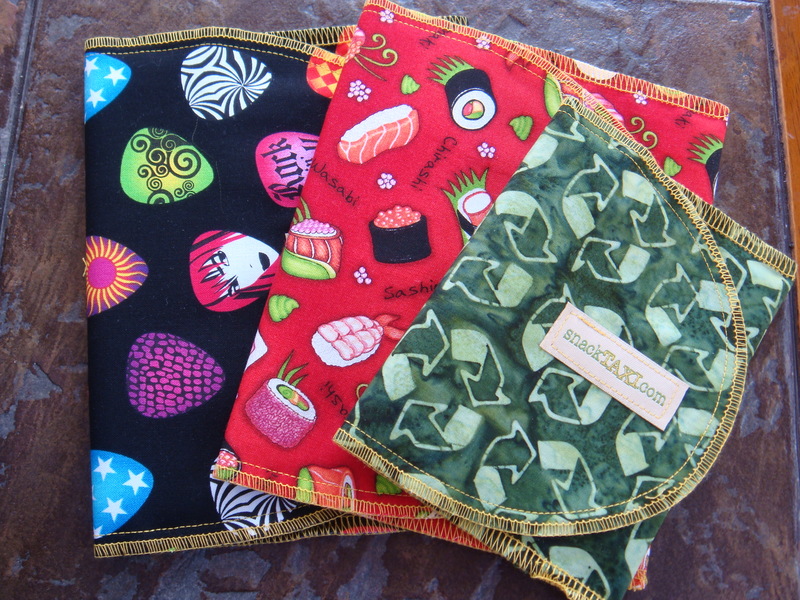 I wound up ordering 4 bags — 2 sandwich sacks (7.5″W x 6″H) and 2 snack sacks (6″W x 4.5″H). They arrived quickly and I was very pleased with the quality and structure of the product. These are the awesome designs I got… guitar picks, sushi, recycling logos and guitars. Aren’t t hey great??? I invented snackTAXIs as a way to stem the tide of plastic Ziploc bags that flowed from our house to the landfill when our 3 kids started school! We pack over 500 lunches every year, and had definitely fallen prey to the easy appeal of the Ziploc bag.snackTAXIs are easy too- really! They are made in our home-based workshop by talented (and fun!) local sewers- we are committed to keeping our business local, and will never outsource our labor. We hope you’ll enjoy using snackTAXIs as much as we enjoy making them! So ever since we received them, we have been using our snackTAXIs daily for my son’s PB & J sandwiches for school. They work GREAT! You can throw them in the washing machine or dishwasher… but we generally wash them by hand since we use them daily. I also use the larger size for bringing my toast to work with me. I just face the buttered-sides in. They work perfectly! 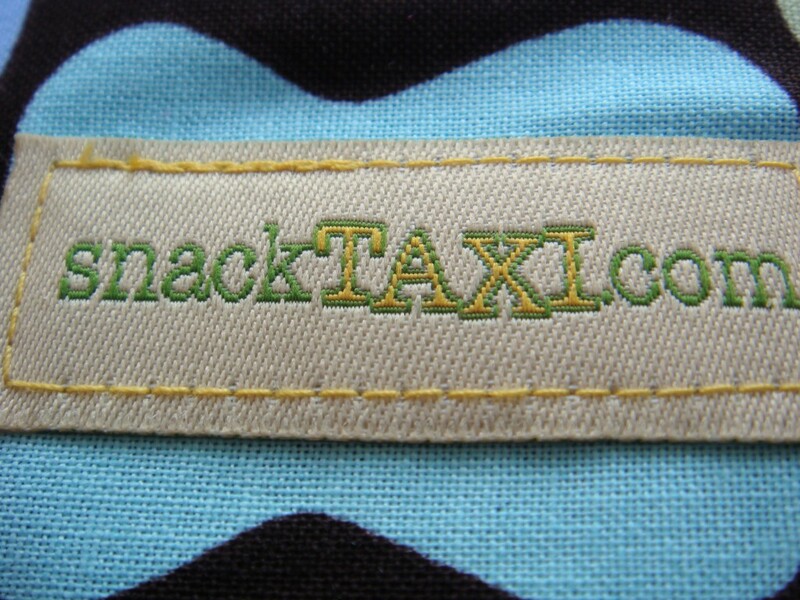 SnackTAXIs are lined with a waterproof material that consists of nylon with a polyurethane coating. After talking to many manufacturers of this product, we understand that this type of coated nylon is free of heavy metals and phthalates. We have found a supplier of this coated nylon who has had their product extensively tested. The tests revealed that the nylon is free of heavy metals (including lead), phthalates, PBBs, and PBDEs. We will be ordering all of our nylon from this supplier going forward. So they are also free of nasty heavy metals and phthalates! What more could you ask for in something you put your and your child’s food in? If you have kids… you will LOVE these bags!